As well as being environmentally friendly, LuxCraft Poly Furniture is a fantastic choice for outdoor furniture because it is completely maintenance free. 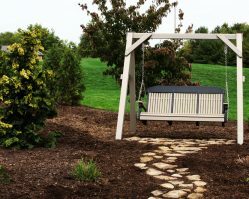 It can be kept outdoors all weather and all seasons and you will not have to rub it down, re-paint it or re-stain it at any time. It will not rot or grow mildew, will not attract termites, and it will not suffer when conditions are hot and sunny. LuxCraft Poly Furniture is UV Stabilized and it will not fade or warp in the sun. LuxCraft are so confident of this that they offer a Lifetime guarantee on their products. LuxCraft furniture is available in a beautiful range of colours and you will find a shade to suit your taste whether you prefer traditional browns, light, soothing shades or striking vibrant colour combinations. 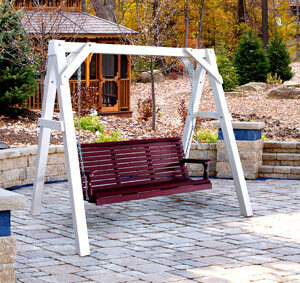 LuxCraft offer their poly swings and porch swing in different sizes and designs. 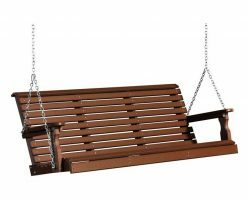 There is a 4 foot swing to comfortably seat two, and 5 foot swing for three. Designs include a highback or rollback design depending on your preference; relax and soak up the ambiance whilst gently rocking to and fro in perfect comfort. LuxCraft Poly Furniture is a great choice for anyone who feels conscious of their duty to minimize damage to the environment because LuxCraft takes advantage of green recycling in their manufacturing process. 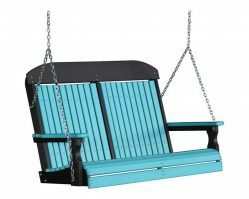 With such a wide range of seating, patio furniture, poly swings and more, in such a great choice of colours, you are sure to find the right product for your outside area. 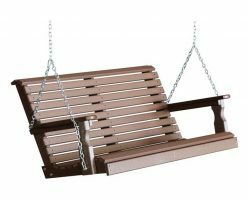 Add to this the fact that poly deck furniture is maintenance free and you will be pleased you chose LuxCraft Poly Furniture.